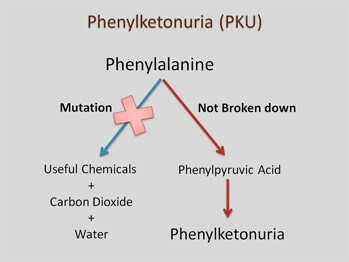 One of the earliest known gene/diet interactions is Phenylketonuria or PKU. PKU is a good example of how genes determine how our bodies react to nutrients in our food. PKU is a genetic disorder caused by a autosomal recessive allele. It is tested for at birth. Babies that are homozygous recessive for the allele are unable to produce an enzyme called phenylalanine hydroxylase (PAH). PAH is needed to break down (metabolise) the amino acid phenylalanine. Phenylalanine is an essential amino acid, which means we have to get it from the food we eat. Major sources of phenylalanine include dairy products, meat, fish , poultry and some nuts and pulses. The metabolic breakdown of phenylalanine produces a number of key compounds needed by our bodies such as melanin and thyroxine. In metabolic pathways each step is controlled by an enzyme. The chemical/substance produced/found at each step of the pathway acts as a precursor to turn on the gene producing the enzyme to metabolise the next step. In the metabolic breakdown of PKU, PKU acts as a precursor to turn on the gene that generates PAH. PAH breaks down phenylalanine into tyrosine. The presence of tyrosine turns on genes to produce other enzymes to continue the metabolic pathway. People who are homozygous recessive for the gene that codes for PAH do not produce the enzyme. Therefore phenylalanine will not be broken down into tyrosine. Instead it is metabolised into phenylpyruvic acid. A build up of this chemical in the body can result in problems with brain development, leading to mental retardation and seizures. As well the lack of tyrosine means that the genes for the remaining enzymes in the pathway are not expressed.